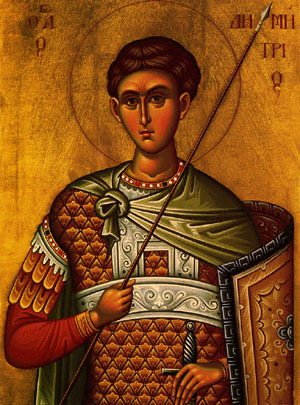 Saint Demetrius was a Thessalonian, a most pious son of pious and noble parents, and a teacher of the Faith of Christ. When Maximian first came to Thessalonica in 290, he raised the Saint to the rank of Duke of Thessaly. But when it was discovered that the Saint was a Christian, he was arrested and kept bound in a bath-house. While the games were under way in the city, Maximian was a spectator there. A certain friend of his, a barbarian who was a notable wrestler, Lyaeus by name, waxing haughty because of the height and strength of his body, boasted in the stadium and challenged the citizens to a contest with him. All that fought with him were defeated. Seeing this, a certain youth named Nestor, aquaintance of Demetrius', came to the Saint in the bath-house and asked his blessing to fight Lyaeus single-handed. Receiving this blessing and sealing himself with the sign of the precious Cross, he presented himself in the stadium, and said, "O God of Demetrius, help me!" and straightway he engaged Lyaeus in combat and smote him with a mortal blow to the heart, leaving the former boaster lifeless upon the earth. Maximian was sorely grieved over this, and when he learned who was the cause of this defeat, he commanded straightway and Demetrius was pierced with lances while he was yet in the bath-house, As for Nestor, Maximian commanded that he be slain with his own sword. Share the feast of The Holy Great Martyr Demetrius the Myrrh-streamer with an icon greeting ecard.